Cameron Carter-Vickers scored the only goal of the game on his Sheffield United debut to help the Blades beat winless Bolton in the Championship. Carter-Vickers fired into the roof of the net after his first effort from a corner was blocked by a defender. Daniel Lafferty almost doubled the lead after the break, but his header was cleared off the line by David Wheater. Bolton improved late on, but Jem Karacan's weak shot was the closest they came to an equaliser. 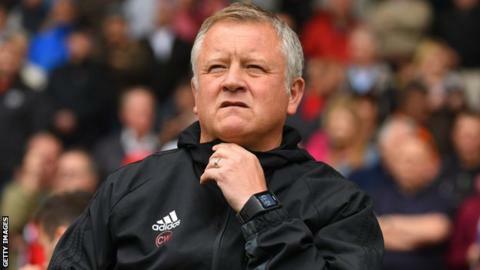 Sheffield United have now won four successive games and are third in the Championship table. Bolton have found the step up from League One far more challenging than the Blades, bottom of the table with just two points from their first seven games. The Trotters managed two shots on target as Sheffield United kept their second clean sheet in 39 league visits to their opponents. The Blades only mustered one more shot on target, but they were rewarded for Carter-Vickers' persistence on his first appearance since signing on loan from Tottenham. "We couldn't have given much more. We gave absolutely everything. The energy levels were great and there were some of the best individual performances we have had this season. "I feel for the boys, I feel for myself and the supporters because we have lost another game. "Maybe somewhere around the corner something is going to fall to us, someone is going to block to one of us and we are going to smash it into the back of the net." "We are delighted with the result. It was a hard-fought game and the result could have gone either way, if I am honest. "Bolton's start hasn't been great but the similarity from last year - us knowing a little bit about them and them knowing a little bit about us - brought the teams closer together in terms of performances. "This, in my opinion, is our best result, not the best performance, from our season so far." Match ends, Bolton Wanderers 0, Sheffield United 1. Second Half ends, Bolton Wanderers 0, Sheffield United 1. John Lundstram (Sheffield United) hits the bar with a right footed shot from outside the box. Assisted by John Fleck with a through ball. Jem Karacan (Bolton Wanderers) wins a free kick in the defensive half. Attempt saved. Jem Karacan (Bolton Wanderers) right footed shot from the centre of the box is saved in the bottom left corner. Assisted by Gary Madine with a headed pass. Gary Madine (Bolton Wanderers) is shown the yellow card for a bad foul. Substitution, Sheffield United. Chris Basham replaces George Baldock. Filipe Morais (Bolton Wanderers) wins a free kick on the left wing. Attempt blocked. Gary Madine (Bolton Wanderers) header from the centre of the box is blocked. Assisted by Filipe Morais with a cross. Corner, Bolton Wanderers. Conceded by Leon Clarke. Corner, Bolton Wanderers. Conceded by Cameron Carter-Vickers. Attempt blocked. David Wheater (Bolton Wanderers) header from the centre of the box is blocked. Assisted by Mark Beevers. Attempt missed. Gary Madine (Bolton Wanderers) header from the centre of the box misses to the left. Assisted by Filipe Morais with a cross following a set piece situation. Daniel Lafferty (Sheffield United) is shown the yellow card for a bad foul. Foul by Daniel Lafferty (Sheffield United). Mark Little (Bolton Wanderers) wins a free kick in the attacking half. Attempt missed. Paul Coutts (Sheffield United) right footed shot from the centre of the box misses to the right. Assisted by George Baldock. Attempt missed. Filipe Morais (Bolton Wanderers) right footed shot from outside the box is just a bit too high from a direct free kick. Foul by Cameron Carter-Vickers (Sheffield United). Corner, Sheffield United. Conceded by David Wheater. Substitution, Bolton Wanderers. Aaron Wilbraham replaces Antonee Robinson. Cameron Carter-Vickers (Sheffield United) wins a free kick in the defensive half. Substitution, Sheffield United. David Brooks replaces Billy Sharp. Josh Cullen (Bolton Wanderers) wins a free kick in the defensive half. Substitution, Bolton Wanderers. Adam Le Fondre replaces Adam Armstrong. Jem Karacan (Bolton Wanderers) wins a free kick on the left wing. Substitution, Sheffield United. John Lundstram replaces Mark Duffy.